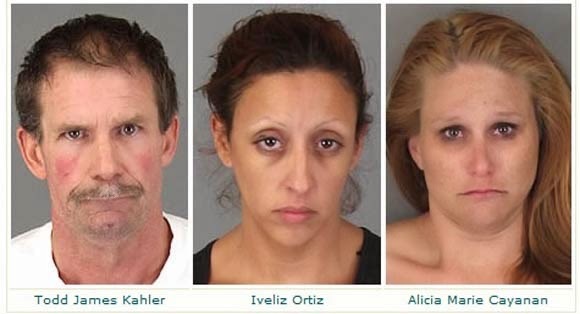 Three people were arrested on drug-related charges Aug. 28 after Sheriff's deputies responded to the report of a disturbance at a residence in Wildomar, police said today. At approximately 4 a.m., officers responded to a residence in the 33600 block of The Farm Road in reference to a verbal altercation. Subsequent investigation revealed there was a dispute over property at the location, police said. During the investigation, officers located over an ounce of methamphetamine, a digital scale, and additional narcotic paraphernalia inside the residence. There also were children at the residence while narcotics were present. Child Protective Services was notified, responded to the home, and took custody of the children. -- Todd James Kahler, 52, of Wildomar was arrested for possession of methamphetamine for sale, child endangerment and possession of narcotic paraphernalia. -- Iveliz Ortiz, 35, of Wildomar was arrested for child endangerment and being under the influence of a controlled substance. -- Alicia Marie Cayanan, 32, of Wildomar was arrested for being under the influence of a controlled substance. All three suspects were transported to the Southwest Detention Center. Anyone having further knowledge or information pertaining to this case is encouraged to contact Officer Martinez at the Wildomar Police Department at 951-245-3300, or after hours at 951-776-1099.